Home » Featured » What do lifeguards do on their day off? Two local lads, spent their summer on the beach like many other youngsters. Except with a catch – they were paid for it! Meet lifeguards and mates Eric Lawton (20), on university holidays and Nicholas White (18), on a gap year after finishing Year 12 in 2017. 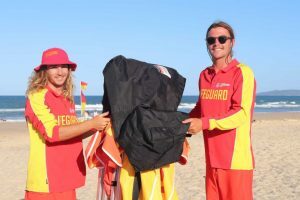 They were educated at Rainbow Beach State School and Gympie State High School, and for both, it was their rookie season of lifeguard work. You can’t underestimate the value of that local knowledge. These boys have surfed, fished and dived our waters since they were tiny. But to work as a lifeguard – they really need a broad range of skills, from driving to using the jet ski, and first aid and rescue skills necessary in a more remote location. Most of us can sympathise there, especially in the busy summer holidays. However, being paid to spend days up at Double Island Point, a favourite location in the world for many of us, is worthy of our envy. Both were rostered five week days and had weekends off, alternating every few days from Double Island Point to Rainbow Beach. They thanked the crew, and locals and tourists, and hope to patrol next Christmas here. So what do these two lifeguards do on their weekends, and after work? Working on the beach all day, wasn’t enough. They were back surfing, every chance they had!